Three-way, can be used to create tray / inlay frames or a boxy panel frames. Shown here as an inlay with a step separator, the canvas will sit on the bottom shelf - Style A. For a long time this moulding has been our best selling canvas moulding. The rebate depth used in this style is 22mm for most standard bar canvases, the front face is 10mm and the outside edge is 38mm deep. All plain woods will painted or stained to order. Used in style B this moulding makes a very boxy panel frame - can be used with glazing - please note the panel or artwork will sit under a boxy edge and some of the image will be lost under the rebate if no Matt is being used.. This style makes a striking frame with a deep sight edge, can be used to accommodate a standard bar canvas, panel or with glazing and a Matt mount. All plain woods will be painted, stained to order. Style C shows the moulding used again in the tray style - no glazing this time with the wider edge uppermost. The front face now is 15mm wide, again the canvas or panel will sit on the shelf and the step acts as a separator. The rebate depth now is 20mm to the bottom shelf. All plainwoods finished to order, see Finishes Available for more information. 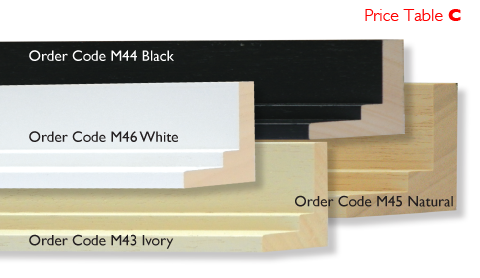 Obeche plain wood and three pre stained colours - Black, Bright White and Ivory. Canvas inlay 2 way can be cut shallow for standard bar canvases where the rebate depth is 28mm, a slim faced moulding - only 5mm across the top, this is often cut over large to create a floating inlay for canvases. Seen here cut to accommodate deep bar canvases the rebate depth is now 41mm, again with a very slim 5mm top edge the step can act as a separator or this can be cut over large to float a canvas in the interior space. 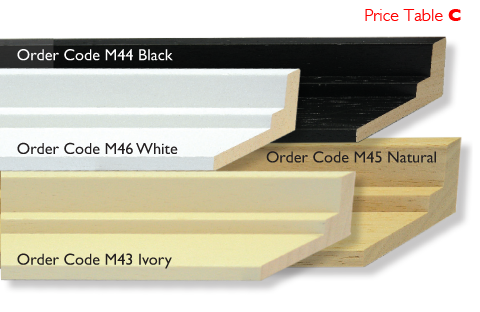 These mouldings are available pre sprayed in Bright White, Black and Ivory or in plain wood which we shall finish to order. Another canvas L with a larger presence as the moulding slopes outwards and at it widest point it is 30mm wide, overall the moulding is 50mm wide including the shelf making it particularly strong and easy to re-use. Generous shelf area to ease fitting. the rebate depth is 25mm for standard bar canvases. In plain wood we will paint or stain this frame to suit your work.